Things you’d have preferred not to find out! The perils of family history research. Oh Dear! No wonder the Pagets and Beattys emigrated in 1878. I have found James Paget’s will. He made our gg grandmother Hannah Dempsey (note use of her maiden name) the sole executor. Subsequently she sold all his remaining land in Ireland at the Landed Estates Court in 1874 to one of James’s second cousins John Paget Bourke for £6,225. Hannah continued living at Kinard Lodge with the children until they emigrated 3 years later. It’s pretty clear now that James and Hannah were not technically married. Also, I had wondered why James Beatty didn’t set up as a Draper in Melbourne and instead worked in clerical or travelling salesman jobs. Well he evidently wasn’t such a great businessman since his Ballina drapery business went broke! This fire sale was just a couple of months before Archie’s birth. I wondered why Archie was born at Kinard Lodge and not in Arran street, Ballina like his siblings James and Emma. Anyway, on the far side of the world nobody knew (until now!) about illegitimate births or bankruptcies. Hannah was the widowed Mrs. Paget for the rest of her life and she and her eldest son James Paget both bought farms at Baddaginnie in Victoria while James Beatty and Marcella (nee Paget) were friends of the bishop in South Yarra, Victoria and all highly respectable. I did find out something that might be a good lead on the elusive Beatty ancestors though. At about the same time as our g grandfather James Beatty the draper (who was born somewhere in county Fermanagh) appeared on the record in Ballina, Mayo, an Archibald Beatty, merchant, appeared there too. Of course his name (Archibald) made me wonder if they were related even apart from their sudden appearance in Ballina at about the same time. The earliest mention of this Archibald in any source I’ve found so far was 1861 and he isn’t mentioned in connection with Ballina after 1871 and I don’t know where he went. [Update Apr 2015: He moved to Liverpool in 1874]. Anyway, look at this notice about the birth of his daughter in 1861. It would have been more useful if it had named either his wife or daughter, but it does have three VERY interesting words “late of Lisnaskea”. Where is Lisnaskea I wondered? Have you already guessed? It’s in County Fermanagh 🙂 The plot thickens! 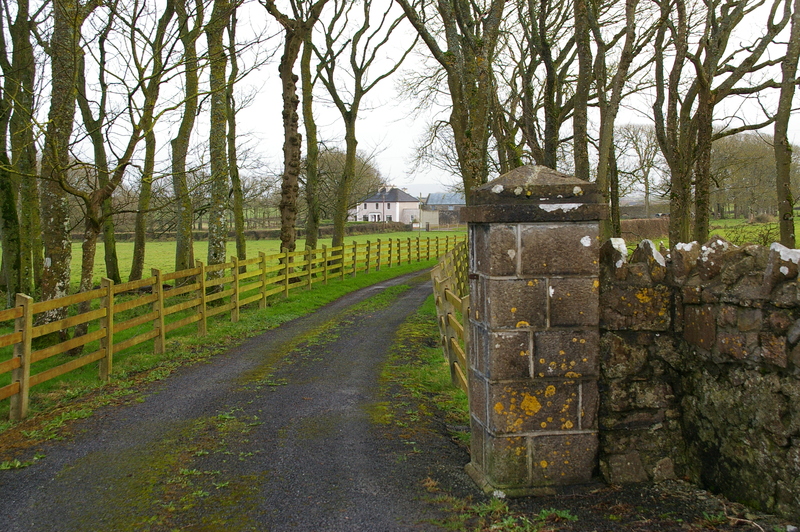 The Pagets were a minor family who did not figure much in the political and social life in North Mayo. They were Justices of the Peace, sat on the Bench and served in the army. Their daughters married local landowners but the family died out. Has this branch of the Pagets died out? In terms of descendants with the Paget surname I think they have, even in Australia. There are dozens of descendants in the Paget Bourke and Paget Beatty and other lines, but no actual Pagets that I know of who are descended from the first Thomas Paget of Knockglass. If you know better please contact me. There are lots of things I’d like to add to the Paget chapter such as maps of Knockglass and Kinard from the 1840s, but I can’t link directly to the Griffith’s Valuation maps of the estates themselves and am prevented by copyright from displaying them. Maybe at some stage I’ll draw my own! Also I’ve heard from people who lived at both Kinard and Knockglass, the former especially with wonderful accounts of life there in the mid 20th century some details of which can’t have changed all that much since the Pagets lived there. I might add some of that eventually if my sources agree. There are tantalizing unresolved issues in this story which I could spend the whole rest of my life trying to tease out. Much more is to be discovered at the Registry of Deeds for example and if there’s a lawyer in the family I’d love to have some help working out what those deeds are actually saying in among all the verbiage. Now for the Beatty part of our Irish story. They will probably be equally fresh fields but much harder work. Left Dublin at 9.30 this morning in a little Suzuki hatch, switching the wipers on and off instead of the indicators. It was more annoying than usual because I then couldn’t see since it was raining. Drove through several indistinguishable counties, though the scenery got progressively more interesting through the morning with lakes and finally as I reached Co. Sligo, some actual hills. After 4 hours I reached Enniscrone, where Archie Beatty was born. The first visit was to Kinard Lodge to take some photos. The nice lady who currently owns it, Mrs. Mary Judge was really interested in the history of the house and invited me in for a chat and showed me around. The inside was completely renovated about 30 years ago and only the windows, deeply inset in the stone walls still look Georgian but the sheds and gates outside look original. Next I went to Kilglass Church, wrestled open the big cast iron gates and found James Paget’s tombstone. It’s now very hard to read, and like everything in Ireland, covered in moss. Apparently the person to talk to is a Mrs Mac Hale who knows the whole history of Enniscrone. I might see her tomorrow. Some friendly locals were interested to help trace the Pagets, but quickly concluded “Oh They’d have been the Landlords. The enemy! We wouldn’t know anything about them!” only half joking after 150 years. Enniscrone is a seaside town, the stone buildings still huddled along the original narrow road through the town, probably little changed since the Beattys and Pagets left in 1877. The beach is very wide at low tide and pretty impressive even to Australian eyes, and this afternoon a fierce surf was rolling in from the Atlantic driven by a bitingly cold breeze. I hope conditions were milder when Captain Matthew Webb swam across Killala Bay from here. According to the story he was accompanied by James Beatty’s father James. I wonder if there’s a grain of truth in that or if it’s another family myth? I went on a bus tour on Sunday when the Libraries and Archives were closed, and I hiked right across town via Dublin Castle and Chester Beatty Library with books and manuscripts from antiquity which should be really interesting some other time. I was thinking Dublin is a very grey place, until for a few hours the sun came out one day, and then I discovered the Registry of Deeds. I’m glad I did so much homework before leaving because the amount of genealogical resources here is astounding. Given sufficient time here I could probably even work out the Beattys. This trip I’m focussing on the Pagets though, and since they were landholders, there’s an unexpected place that I’ve found out quite a lot more about them, although not always what I was expecting to find. All the stuff in the Registry of Deeds escaped the Four Courts fire of 1922 which destroyed so many Irish records. It’s mostly about Land purchase and agreements to do with property, marriage settlements etc. going back to 1705, all couched in abstruse legalese, but full of genealogical information all the same. What’s really fun is the place itself though. The indexes to the deeds, and hand written copies of every one are in thousands of enormous books referred to as “tombstones” – giving you an idea of their size and weight. The earlier ones are written on skin of some kind, and many are leather bound, once beautiful but suffering badly from over-handling. Most have been given hessian covers with their numbers stencilled on them like wool bales. The “tombstones” are arranged in special pigeon holes all around the walls of several large rooms up to about 4 metres high. It’s all self serve once the system is explained, so you have to climb up and down tight spiral staircases and lug these things up and down ladders to consult them. You sit on high stools to read them like Uriah Heep in illustrations by Phiz. I’d have loved to take photos, but it isn’t allowed. 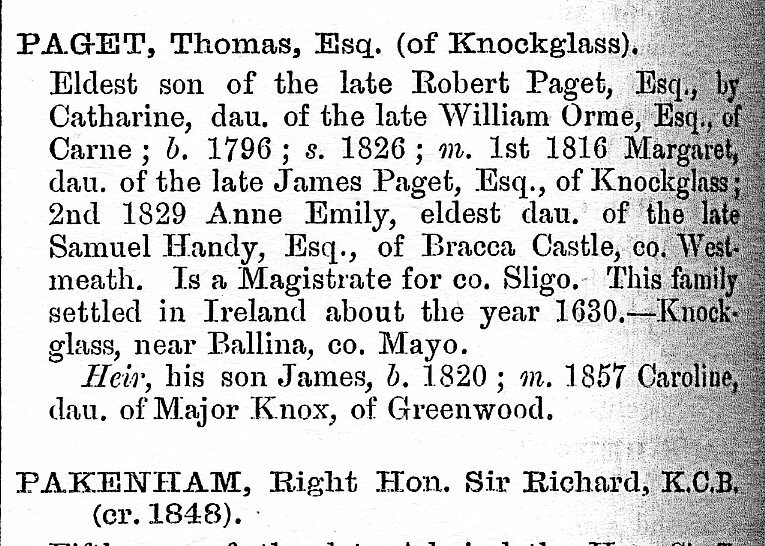 I’m sure now that James Paget of Knockglass who purchased Kinard townland in 1810 is the father of Marcella’s father James Paget who built and lived in Kinard Lodge. Two documents that I’m having copied make this clear, though I still don’t know his mother ‘s name. Also, James Paget of Kinard Lodge married a Catherine Benson in 1829, who was still alive and married to him 20 years later only 4 years before Marcella was born whose mother, and the mother of all James’s children was Hannah Dempsey, not Catherine. There’s a particularly abstruse document from 1849 that might be some sort of separation agreement between James and his first wife. In 1867 James seems to be entailing Kinard to others because he has no legitimate heirs, at a time that Marcella and at least two of her brothers were well on the scene. Not sure what to make of that yet. I could go off on a tangent researching Irish marriage and heredity laws but might shelve that issue until I get home. You can see Kinard Lodge on the satellite version of the map link provided by this document, but in maps with historic overlays (links on rh column of this page) you can see that in 1840 it had extensive formal gardens. In 1814 there appears to have been no landowner’s residence at Kinard. The earliest reference to Kinard as a residence that I can find is 1834, when it is the residence of James Paget. He may have built Kinard Lodge sometime in the 1820s. I don’t know about the “extravagant living” described in the article, though maintaining that garden may have cost a bit. The rest of it fits pretty well though. It would have taken a hard landlord to expect starving tenants to keep paying full rent, no matter what the debts. Spurred by a few high-handed landlords in Mayo, by the 1870s the Fenian movement was gaining ground too. I enjoy imagining the young Paget boys saying “Dad, let’s cut our losses and emigrate. Every one else is!” and him saying “Over my dead body!” Which it turned out to be. It was probably considered a shrewd move on Marcella’s part to have married a merchant like James Beatty. Neither of the James Pagets mentioned here are our GG Grandfather. Our James (born 1803) is most likely the younger brother of Thomas. It’s interesting that Thomas seems to have married his cousin. That could have been to consolidate the Estate. The fragmentation of the estates due to the inheritance laws was a problem at the time. The father of our James was probably either the father of Thomas (Robert Paget)or of his wife Margaret (James Paget of Knockglass). Kinard Lodge was taken over by a Captain John Paget Bourke after our Pagets left. I think he was a nephew of Thomas Paget, whose sister married a John Bourke. When our Aunt Peg Beatty went to Enniscrone and Ballina in 1952 in search of Beatty and Paget relations she was sent to see a “Mr Paget Bourke” of Ballina. Sadly he was not at home or all of this might have been easier! To get much further I probably need to consult books and records which are only held in Dublin, especially at the National Library of Ireland. Anyone want to come with me? Added 9 May 2012: My most up-to-date information on the Pagets is now part of The Forgotten Pagets of County Mayo – see the link to other chapters of the family story in the right hand column. This was one of those exciting discoveries that keep us family historians hooked. It happened a few weeks ago now, before I had a website, but I thought it deserved a post. We knew the name Paget mainly because Beatty boys kept getting it as a middle name through a family tradition based on it being an ancestral connection with some social pretensions, and we vaguely understood it to be the maiden name of Marcella, the wife of Jas. 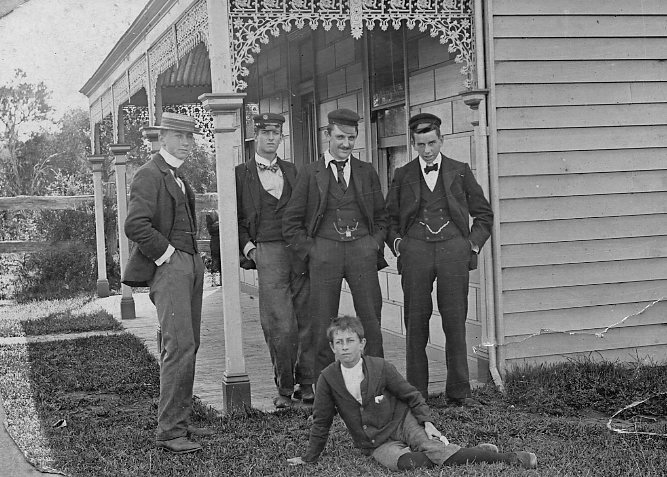 Beatty who brought his family to Australia in the late nineteenth century. Both the index records and Marcella’s death certificate named her parents as James Paget and Hannah Dempsey which pushed the family tree back another generation. A Google search then found those names connected in this record of a Paget estate called Kinnard (or Kinard) Lodge near Enniscrone, County Sligo. 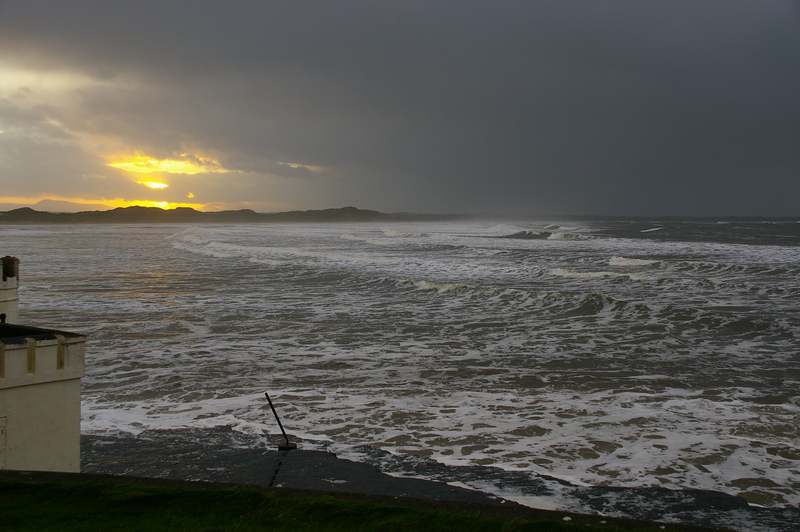 Archie Beatty’s descendants all knew that he had been born at Enniscrone shortly before his family left for Australia. A bit of collaboration discovered James and Marcella’s marriage certificate where the occupation of her father, James Paget is given as “Gentleman” whereas his father (also James Beatty) is a “Farmer”. Another connection was made while scouting through digitised Argus pages in TROVE (surely the cleverest thing that the National Library of Australia has ever done!). Look what the Beattys call their house in Caroline St., South Yarra at the time of Charles Gordon’s birth. What the heck is someone claiming to be a son of “James Paget of Kinard Lodge, Ireland” doing in Violet Town, Victoria? Our Pagets are all supposed to be in Ireland being gentry!! 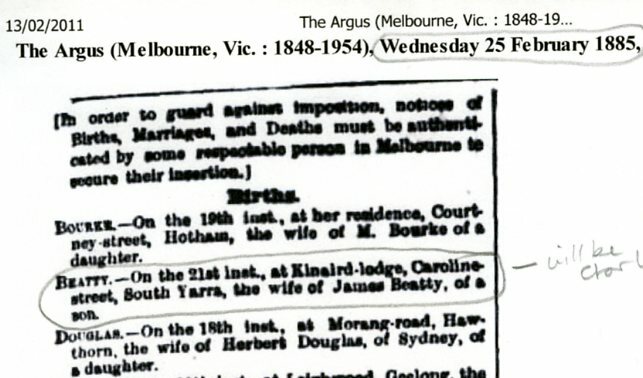 I spent an afternoon checking all the Paget births, marriages and deaths in the indexes forVictoria. A high proportion of them took place around Voilet Town and Baddaginnie. It became clear that two sons of James Paget had come from Ireland to Victoria, married two Beggs sisters and had many children, later losing most of their sons in the First World War. In fact at one stage, half of the Pagets in Victoria were certainly relations of ours. The most interesting entry of all was for a “Hanorah” Paget who died at Baddaginnie aged 75 in 1897. Surely it couldn’t be Hannah herself? Another $30 for the death certificate and YES! She is our Hannah, wife of James Paget, born in Ireland having arrived in Victoria the same year as James and Marcella Beatty, with her children listed with ages given including Marcella, James, and Charles. Yay for informative Victorian death certificates. If she hadn’t come to Australia we’d have been lucky to find a death certificate for her at all, and even so it would have had far less information. And yes, the name of her father, John Dempsey, pushes the family tree back another generation. It’s a shame that Charles Paget who was the informant didn’t know his grandmother’s name. Oh well, the hunt continues. Added 9 May 2012: My most up-to-date information on the Pagets is now part of “The story” – see the link to it in the right hand column. The Beatty boys of South Yarra used to get into altercations with boys from Richmond at the boundary of their territories, the Punt Road bridge across the Yarra. The eldest, Jim was very big and used to sit on the most troublesome of the opponents while his 3 younger brothers and friends dealt with the rest. Jim certainly isn’t in this photo, and we don’t think Charles Gordon is either, but if this lot of likely lads were defending the South Yarra end you’d think twice before crossing the bridge! I wonder what the Forsters of Toorak would have thought?